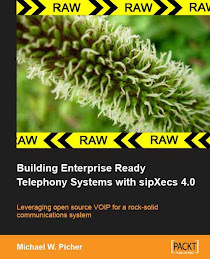 Douglas Hubler (aka, Lazyboy, aka, lazieburd) (Douglas' Blog) a long time sipXecs contributor and former Pingtel employee is offering up an alternative sipXecs build to the community build offered by Avaya. Douglas has added back in some code that had 'disappeared' before 4.2.0 was released. Also, he is setting up build shop on the open suse build service which makes it easier to build for many other distributions. There are also some more builds for other distros than supported by the Avaya builds. Basically the process to start using the new builds is to change your sipxecs.repo file and do a 'yum update'. Backup your system and get the backup off of the PBX (the update does an in-place upgrade, but you can never be too safe). Login to your sipXecs box as root and edit your sipxecs.repo file ('nano -w /etc/yum.repos.d/sipxecs.repo'). Comment out the existing sipXecs yum info with '#' in front of each line. Once you have your .repo file setup properly, run a 'yum clean' and then a 'yum update' from the command line. I rebooted my sipXecs box after the yum completed. Big thanks to Douglas for the hard work he's putting in! Installed 4.0.4 fresh from ISO (dev build 4.1.7 on my test system was trashed). Added a user / tested. Ran YUM update from command line (265 items to be installed / upgraded, 374 MB worth). A little patience was required on my relatively slow lab machine (800 MHz, Xeon w/1GB of RAM)... web services came up after a couple minutes. New login screen is a little bland w/o graphic image. Background job listed as failed on first login (problem listed as File replication: sipxpage.properties). Created a paging group and re-sent the server profile and paging seemed to come up properly. New GUI is better? different? I wish the tabs were starting from the left instead of centered. Domain aliases of system IP address and host name are added automatically. New user portal is nicer. Can't seem to import GMail contacts. Branch concept in place... need to test. Still no live attendant option as part of Auto Attendant. Special Mode Auto Attendant configuration prominently available on Auto Attendants page. NTP server config in GUI is a nice add. Alarm SNMP MIB now available on Alarm Configuration screen. One note that went across the mailing list (in case you missed it...). upgrade interface have been made too). update', and when it's done, reboot. I'm working on testing a 4.0.4 to 4.2.0 upgrade now. Al Campbell posted today on the sipfoundry web site that version 4.2 is officially released!